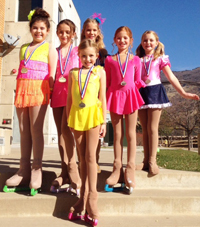 Seven young Sun Valley Figure Skating Club members traveled to Ogden, Utah, Nov. 9-10 to compete at the Wasatch Freedom Classic. Offering only Snowplow Sam through Preliminary events with competitive group sizes between one and five skaters, the annual Wasatch competition offered a fun and friendly competitive environment for beginning-level skaters. Medals were awarded for placing in the top three of each category. Fourth- and fifth-place skaters received participation ribbons. Skating for Sun Valley, Saba Grossman won the Free Skate 4 event; Jessica Blackburn took second. Blackburn also won the Free Skate 4 Artistic event. Bella Martua-Cherry won the Free Skate 3 event. Avery Griffin won Free Skate 1. Bridgette Silva competed alone in Basic 8 Artistic, earning first place for her exhibition. Silva came in second place in Basic 7-8. Alex Griffin placed fourth in Basic 6 Free Skate while Annabel Jenson placed third in Basic 4 Free Skate. Three Sun Valley skaters passed U.S. Figure Skating Tests in Ogden, including Bridgette’s mom, Jen Silva, who passed Adult Pre Bronze Moves in the Field. Martua-Cherry passed Preliminary Moves in the Field, and Avery Griffin passed Pre Preliminary Moves in the Field. Coach Darlin Baker accompanied the skaters to Ogden.